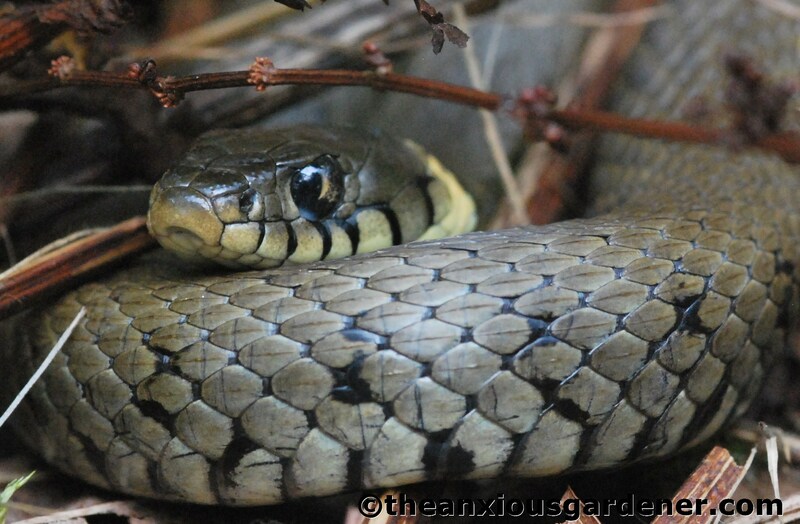 I was strimming the banks of the east pond the other day and disturbed a young grass snake (Natrix natrix). 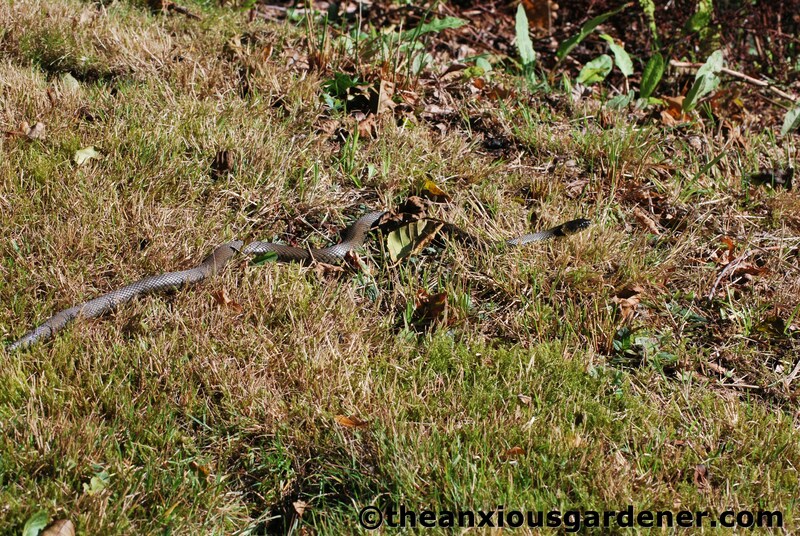 Angrily, he reared up at me like a king cobra; would have been pretty damn scary too – if he’d been any bigger than six inches long. Fearless little chap. 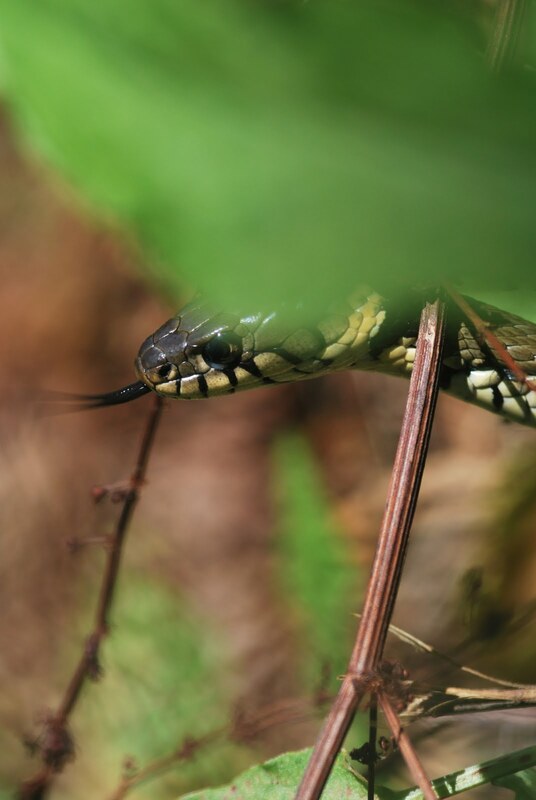 A little later I came across a bigger grass snake; he was about twelve foot long and as thick as my thigh. OK, OK I exaggerate. He was about 18 inches long and as thick as my finger. I’ve seen him several times over the summer, though sadly never when I’ve had my camera with me. Until yesterday. He was sunning himself in the morning sunshine and still very sluggish as he warmed his ‘cold’ blood and geared himself up for the day. As long as I moved slowly, he didn’t seem too concerned by my presence. … so close that you can see my reflection in his eye. … they eat my lovely frogs and my lovely toads. Wish they just ate, like grass. 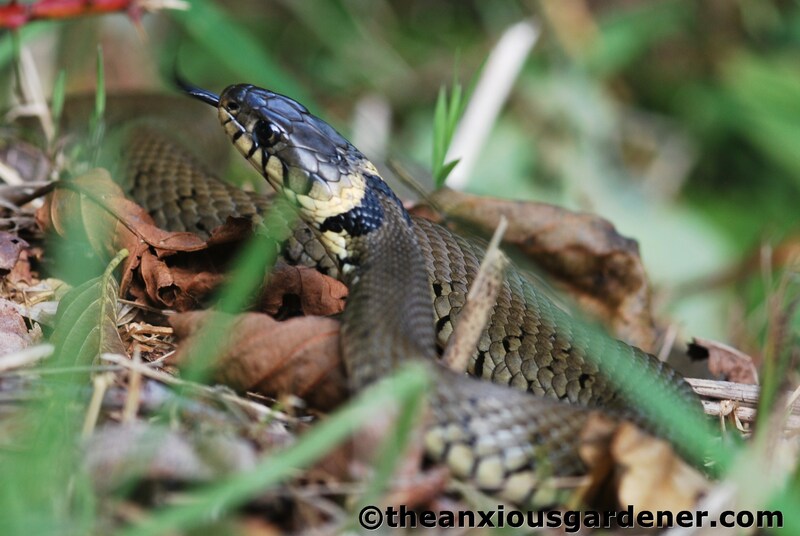 Thanks Shirl, I saw a large grass snake at the Priory last year that had three telltale bumps along it's body. I guess they were frogs. I suppose if it wasn't for snakes and herons we'd be up to our necks in amphibians. Janet, I came across a nest of GS eggs a couple of years ago in a pile of wood chips. Had to ferry the emerging young to safety. Actually seen them fairly often. Pleased you liked the shots. Karen and James – thank you. Glad you like them. Tsuki, yeah it was pretty cool. Hehe, I have heard that joke before but not for a while! That is an amazing reflection! 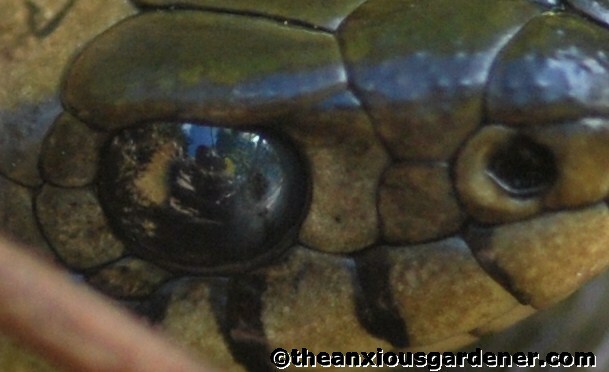 What a great looking snake and a marvellous reflection! Hoooo ! That is a lovely snake ! That is so cool it let you take a close picture of it… Light reflection on its skin as such a smooth aspect, I love it ! Stunning photos – I've still never seen one. 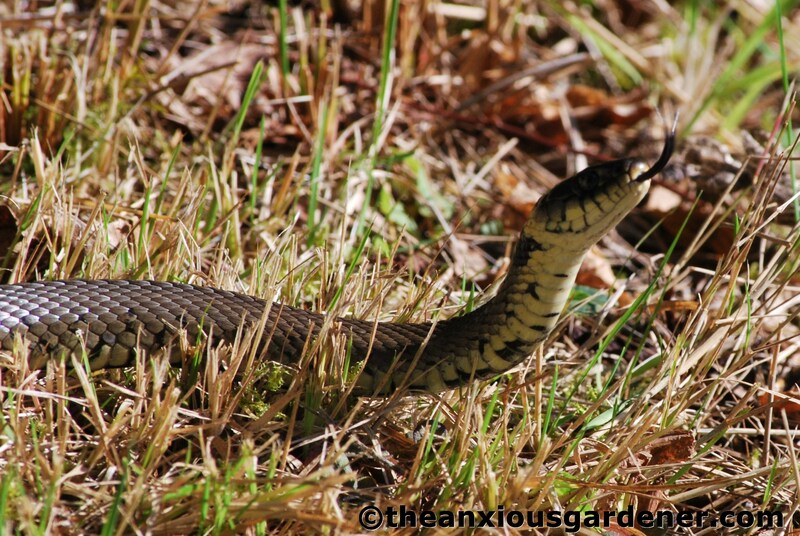 Grass snake, that is… Maybe I should be thankful on behalf of the frogs and toads! This isn't a creature I have ever seen in my garden (or anywhere else for that matter) but if you are happy with your healthy population then I am happy for you! Shame about the frogs and toads but that's nature for you. Hi Janet, eyeballing indeed. He only left in the end when a leaf blew up against him and I think he thought I was responsible. Beautiful but menacing indeed, Petra. I want to be beautiful but menacing and I will be … just you watch. Haven't seen an adder for years and years, Sara though a friend's collie was bitten by one a couple of years ago on the Ashdown Forest. Very luckily he saw it happen, picked up the dog (to delay the poison being pumped around the body) and ran to the vets. The dog survived. Phew. Nah, Jane. If someone shouted snake, I'd run toward it. Except for the time I saw a flippin' big cobra on a jungle path in Thailand …. Thank you Esther – I'm going to try the reflections post this weekend. Thanks for the tip and kind words. He is a beauty, Stacy isn't he? We have bats at the Priory too, so that's good – going by your benchmarks. I was thinking of making some bat boxes this coming winter to help them out as well. 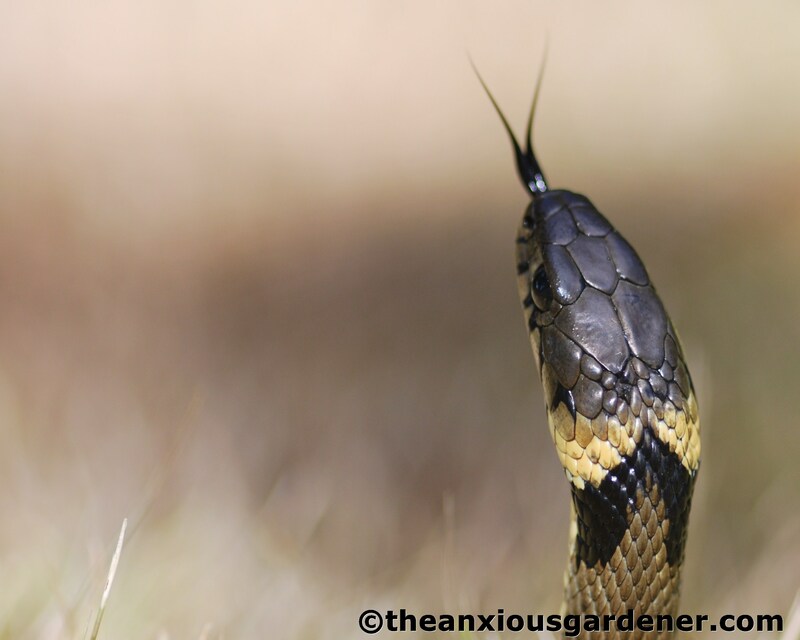 Who knew that snakes also had trouble getting up and running on Monday mornings… Supposedly snakes, toads/frogs, and bats are the three indicators of a healthy ecosystem; as long as your snake restrains itself, you've got two out of three at least. I love the bottom photo especially–that metallic sheen on its head. Do you follow photographic blogs as well as gardening ones? Do you know about Weekend Reflections? That eye would wow participants. Oh Boy…SNAKE!!!!! Run for the hills!!!!!!!!!!! Wow! Never seen one before and can't quite believe they look so (I know this sounds daft) snake-like. Sorry, I grew up in Africa where snakes are common place and mostly lethal. Never thought UK versions would look so similar. I always though they would look more like a worm. These look positively menacing. Beautiful but menacing. i think that's called “eyeball to eyeball”. Wonderful markings.